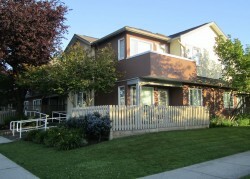 Chelsea Gardens includes a two-story seniors’ building with elevators in East Vancouver. Chelsea Gardens was also the first housing project built following the Society’s creation. Property was acquired from the City of Vancouver on East 52nd Avenue, two blocks East of Fraser Street. Chelsea Gardens added thirty-two cottages in 1956. After redevelopment, Chelsea Gardens reopened in the spring of 1996 with 53 one-bedroom suites for seniors. This property is just a 10 minutes walk to the bustling Fraser and 49th Avenue shopping district. Elevator, a lounge with kitchen facilities and public washrooms. Large 800 sq. foot auditorium with kitchen facilities as well as a large TV, piano, exercise equipment, dartboards and foldable tables and chairs. Tenants can apply for Shelter Aid for Elderly Renters (SAFER) subsidy.